Environmental Impact Study complete and issued entitling immediate additional exploration activities. Guayatayoc and Guayatayoc III are located in Jujuy Province along highway 11, 5 kilometres from the town of Abralaite in the Puna plateau. The property covers approximately 5,000 hectares of the Guayatayoc Salar which hosts favourable geology for lithium and boron, located adjacent to the El Aguillar mountain range, the source of lithium and boron. Previous exploration on the property has returned values between 200 ppm and 800 ppm of lithium. The magnesium to lithium ratios are less than 4 to 1, excellent for low cost processing. Ulexite is seen in outcroppings and in layers only 30 centimetres below the surface. A natural gas terminal is located on the roadside 16 kilometres from the concessions. The area is being actively mined for borates. A PhD study published in 2013 by Steinmetz identifies the seismic analysis of likely locations of aquifers and provides a detailed analysis of the lithology of the basin. During the course of the study the 260 line kilometres of 2D seismic collected by various parties since 1992 was examined and analysed. Holocene aridity caused the increasing salinity, linked to rising evaporation, and playa lake deposits resulted in saturation by hypersaline brines, characterized by Cl- / Na+ (K +) compositions. Residual brines have been differentiated from brackish and saline inflows, originated by leaching ofsedimentary, igneous and volcanic basements, because of K+ enrichment and constant pH (7.5/7.6). Li+ and K+ have parental linkage, while another feeder source provides boron. Las Burras River supplies saline and hyper saline brines, Cl- / Na +, with 20 mg/l of boron, 90 mg/l of K + and 3.75 mg/L of Li +. The comparison between ionic concentrations of residual brines (45 to 125 mg/L de Li+) and Las Burras shows that this river represents the main supply for Li + and boron enrichment, thus Las Buras’s basin offers commercially interesting perspectives for exploration. Laguna Vilama is located in Jujuy Province, in northwestern Argentina along the Bolivian and Chilean borders. The property is comprised of 2,500 contiguous hectares covering the middle of the basin. Early mapping has identified a favourable environment for the presence of brines. The Jujuy province of Argentina is a well-known, favourable mining jurisdiction. Orocobre’s new development at the Olaroz salar, hosts a JORC/NI43-101 compliant, measured and indicated resource of 6.4 Mt LCE (Orocobre website, Oct 2, 2016). 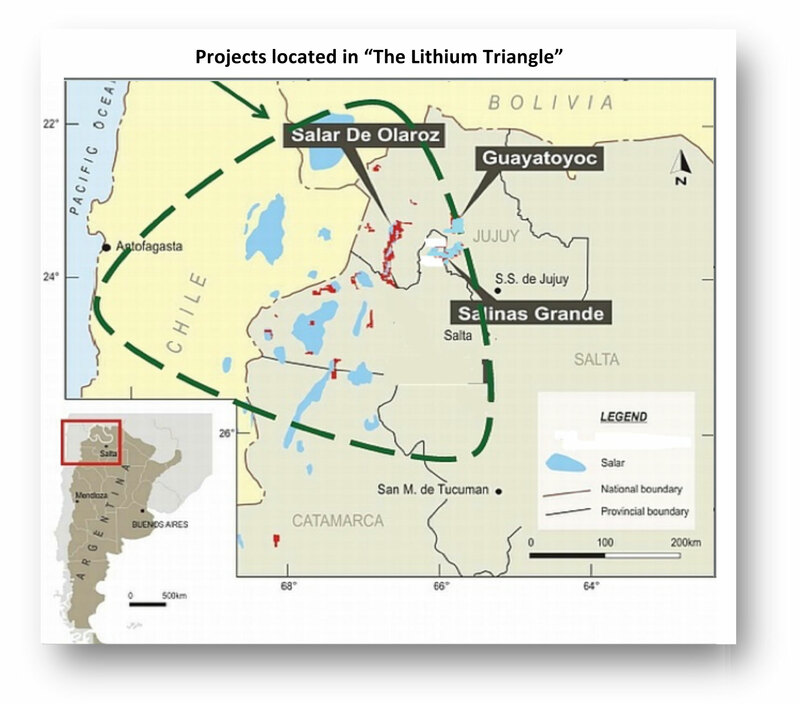 Lithium Americas is developing the Cauchari salar, jointly with SQM a JORC/NI43-101 compliant, measured and indicated resource of 8.7 Mt LCE. (Lithium Americas website. Oct 2, 2016). Both are less than 100km from the properties. The Company has received its drilling permit for Guayatayoc Mina. 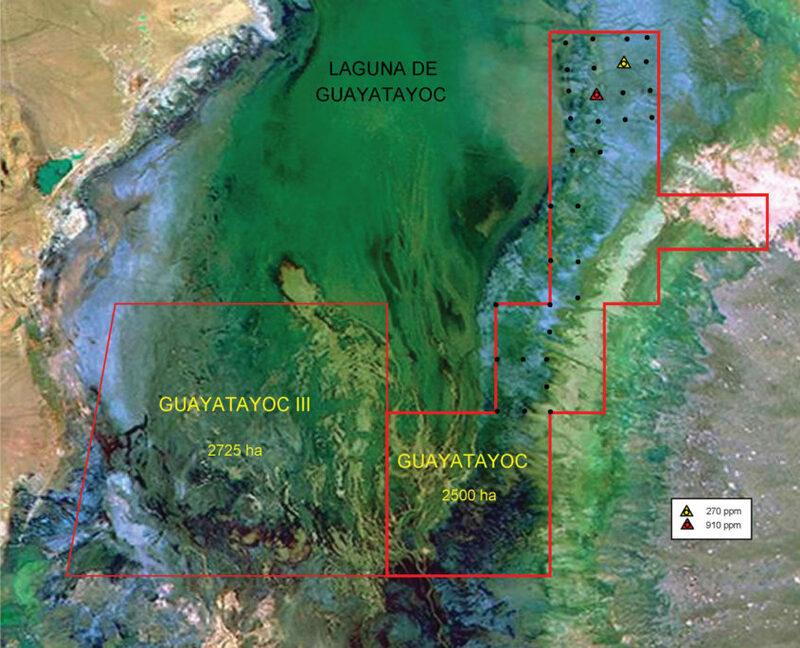 The Company has completed all the necessary requirements under current mining legislation for Guayatayoc III and has applied to the Government of Jujuy to set the date for our UGAMP meeting. The meeting is comprised of several government agencies, communities and the Company to discuss the project and grant final approval of a drilling permit for Guayatayoc III.